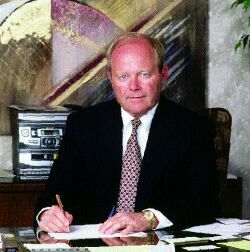 Jeff Peterson became president of Unland Companies in 1986. The Unland Companies, Pekin, Illinois, started life as a life insurance agency. It was founded in 1941 by J. (Jim) Logan Unland, who began selling life insurance for Aetna Life in 1930. In 1942, he opened an office for the purpose of adding fire and casualty insurance to the product line. In 1945, his son joined the agency after being discharged from the army. At that point, P&C premium volume was approximately $10,000. Jim focused his efforts on property/casualty insurance and, through aggressive sales and acquisitions of other agencies, Unland Cos. grew to a point where additional space was needed. It moved from 12 S. Fourth St. to 804 Court St. in 1957. Up through 1975, Jim remained the primary producer with a small staff. At that time, H. Jeff Peterson, a marketing representative of Aetna L&C joined the agency. His principal duties were to retain and develop new business in the Peoria office, which came into existence when Unland Cos. acquired the Reyburn Insurance Agency in Peoria and maintained locations in both cities. The close proximity of the two offices, coupled with the emerging importance of technology, made it prudent for the offices to combine. In 1978, Jim bought a building and combined the two offices under the new roof at 2211 Broadway in Pekin. "It was a godsend to have everyone under one roof," Jeff, the current president of Unland Cos., remarks. He continues that "agency management systems were much easier to use, particularly at that time, in just one location." The location also "gives us room to expand. We currently occupy approximately 6,000 square feet in a good building on top of a hill, but there's more room for growth if we need it." The next year, Afton Booth, a former marketing representative with INA, joined the agency as a producer. The winding road to success took another sharp turn in the 1980s when Unland Cos. decided to become a COMPAR agency with Cigna. Unland Cos. had a longstanding relationship with INA and the idea of having a guaranteed market, regardless of the circumstances, sounded pretty good. "Cigna's philosophy for its COMPAR agents was that if a client paid the premium, Cigna would write the business," Jeff explains. Of course, it meant giving up some independence. Unland Cos. basically operated as a branch office of Cigna. "A lot of our friends at the Big 'I' told us we were crazy," Jeff remembers. "But it did prove to be a very educational and profitable endeavor. That's really where we developed a lot of the expertise that has helped us remain successful and grow when we returned to the multi-company approach in the 1990s, following Cigna's abandonment of the COMPAR approach." One of the advantages of being a COMPAR agent, Jeff says, was that "Cigna helped us with automation. A truck backed up to the office and delivered computers. We did our own underwriting, rating, loss control and so on. Cigna would simply audit the results on a regular basis." $4 million in group benefits. Unland Companies executives (from left) Jeff Peterson, president; Bill Shock (standing), vice president-life/health benefits; Afton Booth, CIC, vice president. 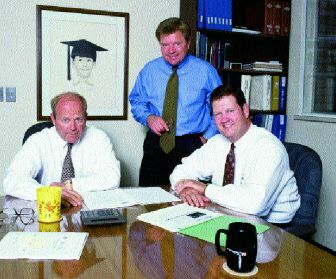 The group benefits business came to Unland Cos. in 1989 when it merged with the Shock Agency, an agency that concentrated its efforts in employee benefit programs. "Bill Shock brought a well-trained staff to our office in an area where we needed to become a player," Jeff says. "I really don't feel that a small agency can survive today without a benefits department." Meanwhile, internal changes also were occurring. Jim sold the agency to the employees in 1986 using an ESOP. Jeff, who helped established the ESOP, became president. Employees automatically begin accumulating shares after two years based on the percentage their salary represents of the agency's total salary. Jeff also established a policy that every person at the agency would be fully licensed--and that includes the receptionist and the controller. Unland Cos. employs 14 people, including four commercial lines producers, one personal lines producer/CSR, one employee benefits producer, three commercial lines CSRs, two employee benefits service representatives, one claims manager, an agency controller/office manager and a receptionist/administrative assistant. The human touch starts right at the beginning with Unland Cos. When you call, you don't have to listen to a computerized voice telling you how pushing a button on your phone will enable the computer to provide you with quicker and better service, while you're sitting there thinking about how much of your time has already been wasted. At Unland Cos., the phone is answered by a real human being who will direct your call to the proper person without hitting you with a menu of options that usually are unrelated to the reason for your call in the first place. "I vowed that Unland Cos. would always have a human being answer the phone," Jeff says. "And we also made it a commitment that we return calls immediately." He continues that everyone at the agency "is responsible for developing a personal relationship with our clients. We want our clients to know that we understand that we are taking care of something that is very important to them and that we truly care about them. We know when one of our client's children is graduating, because that's an important event in their lives, and call to congratulate them. Personal service is easy to do if you're willing to take the time," Jeff maintains. "The result that is we have very little turnover in our clients. We have a great number of clients who have been with us for many, many years." In addition, "this personal relationship goes both ways. They call us when there's a change in their business or personal lives, and that makes our job much easier. If those changes necessitate a change in their insurance coverage, we're there with suggestions. It really helps to avoid that awful situation where a client calls to report a loss and you have to tell him it isn't covered because you--his personal insurance advisor--didn't know he needed the coverage." Equally important, he continues, are Unland Companies' insurance company partners. "We develop true partnerships with our companies. They understand that we are concerned about placing profitable business with them. We have a core group of companies that have been with us since the demise of COMPAR, and their representatives praise us for our concern with their company's bottom line." "We consider ourselves to be generalists, serving all types of commercial lines accounts," Jeff says. "However, we do have several specialty areas that grew out of our relationship with Cigna. In addition to being COMPAR agents, we also were involved with their MarketDyne program, which focused on developing program business and obtaining endorsements from state or national associations. Two of the early endorsements came from the Illinois Association of School Boards and the Illinois Funeral Directors. We got into the school business in the early '80s and developed strong relationships with area school systems." Those relationships with Unland Cos. continued after Cigna left that market and today, Unland Cos. writes 19 school systems through Indiana Insurance and Selective. Three additional school systems have requested quotes. "We use those two markets because they've been in the school business for years," Jeff points out. "Other companies have come and gone, but we want our clients to be insured with companies who are serious about the business and offer a long-term relationship. And, because these companies know the business so well, they offer all the coverages school systems need." Another specialty in which Unland Cos. recently got involved is Bank Owned Life Insurance (BOLI). It's a life product that provides coverage for the corporate officers and tax benefits to the bank. "It's something new for this area," Jeff says. "We basically started it here and are into it big time, marketing it to banks throughout central Illinois." "All of our people are heavily involved in the community, especially with the school systems," Jeff continues. "We consider that an important part of the relationship we have with our client base." For example, Jeff is chairman for the Pekin Insurance Holiday Tournament, which this year will include a team from St. Louis, the first time a non-resident team has participated in the tournament. Pat Taphorn, a commercial lines producer, is the current president of the Chamber of Commerce and also serves as an unpaid assistant basketball coach for the varsity. "We're also active in industry groups," Jeff continues, "as members of the Big 'I'. And I've served on the board of the state Big 'I.' "